Good sounds come out of these mouth holes. This week, in Lititz, Pennsylvania, two young people find love in a group of homeschooled kids from the area. The problem is that families don't approve of their budding relationship, leading to sneaking, lying, and some generally non-church sanctioned activities. This whole situation culminates in a missed curfew, argument, and death. The attempted getaway is something to be remembered, but this whole thing will still leave a bad taste in your mouth. Either way, it's worth the ride to hear this wild story! Along the way, we find out that too many candles in one festival could be dangerous, that parents had no idea about old school social media, and that maybe you should finish the 9th grade before you plan to marry!! This week, in Crandon, Wisconsin, a college student begins an affair with one of his professors, but problems begin to arise. Mainly because this professor is a married woman, and also having several other affairs. Her mild mannered husband doesn't get mad, but instead asks all parties concerned to please stop their behavior. This of course leads to violence, but who will snap first seems like a photo finish, in this case! Along the way, we find out that the names of states apparently used to not use the letter 'y', that a lot can happen in such a rural area without anyone knowing, and that no one can really be calm about being cheated on!! This week, in Clearview, Washington, a man is troubled all his life. Drugs lead to arrests & jail as he slowly progressed in the nature of his crimes, until he finally commits a truly heinous act, and is sent to prison. Problem is, one day, he got out. When he did, he wasted no time in both picking up where he left off, and seeking revenge against all who he feels has wronged him. Will he succeed? Along the way, we find out that you had to bribe people to get them to this town, that parole boards should really do a little homework before releasing people early, and that sometimes even the most brutal act yields little sympathy! This week, in Dunbar, West Virginia, a 12 year old boy disappears, but ends up being found in the worst possible way. The police initially think they have the people responsible, only to find out they didn't. A list of 88 suspects yields no results, until 4 young boys are kidnapped while hitchhiking, and the whole thing takes a bizarre turn. In the end, the most primitive form of justice prevails, and we're not even sure we feel bad about it! Along the way, we find out that redheads need a festival, too, that hitchhiking in the hills of West Virginia is never a good idea, and that sometimes bad people police themselves... brutally! This week, in Bonne Terre, Missouri, a couple's disappearance from their rural property sends their family, and the whole town scrambling. The search continues for longer than it should have taken before tip leads to an awful discovery, and the uncovering of a plot that boggles the mind. Needless to say, people are mad, and that is reflected in the sentencing! Along the way, we find out that abandoned lead mines make the greatest water parks in the world, that some families may just have awful genetics, and if you hide something under enough poop, no one will look for it!! This week, in Logan, Ohio, a young couple has many problems, most of which are enhanced by living with the husband's family for years. This leads to fights, and eventually a nasty divorce. Eventually, one of them, moves on to another relationship, and just when all seems settled, one of the parties disappears, and the hunt is on. What follows is a messy situation, somehow turned into a bigger mess. Along the way, we find out that the washboard is still used as a musical instrument in some places, at what point is having a few people over considered a "church", and how many witnesses can be ignored by the police in a one hour period!! This week, in Burlingame, California, we return for part 2 of the story of a man with a long history of perverted, violent, and downright disturbing behavior works his way through the world, leaving behind a trail of mutilation, and death. With seemingly no remorse, or end in sight, he did the unspeakable to just about anyone he encountered. The worst part of it is how much he seems to enjoy every bit of pain he causes. This one was just too much atrocity to fit into one show. Part 2 of 2!! Along the way, we find out that people dress their pets up, and take them on parade, that a disturbing childhood often leads to a disturbing adult life, and that you shouldn't be pen pals with a man who killed his last pen pal! This week, in Burlingame, California, a man with a long history of perverted, violent, and downright disturbing behavior works his way through the world, leaving behind a trail of mutilation, and death. With seemingly no remorse, or end in sight, he did the unspeakable to just about anyone he encountered. The worst part of it is how much he seems to enjoy every bit of pain he causes. This one was just too much atrocity to fit into one show. Part 1 of 2!! This week, in Bloomingdale, Illinois, a man blows into town, charming some of the local women, but he turns out to have a shady past that very accurately predicts his murderous behavior in the future. His treachery knows no bounds, as he kills, lies, and steals his way around the country. The weird part is, that's just the tip of this crazy iceberg, because his second life turns out to be even more unbelievable than his first. Along the way, we find out that YouTube stars are never to be trusted, that you should never bury a body in a quickly developing area, and that sometimes it's more acceptable to kill 28 people than just one!! This week, in Dallas, Oregon, a successful family gives up the grind of the city, and moves out to the country, so they can run a farm, and shelter their children from the dangers of the big city. This plan works beautifully for a while, until it's proven that you don't have to be in the city to have murder come knocking on your door. The events leading up to the tragedy are as crazy as they come, complete with murder instructions, whispered by forrest! Along the way, we find out that wine is better while it's raining, that wolves & trees might not give the best life advice, and that you should always bring a decent murder weapon with you, when planning to murder!! This week, in Bonaparte, Iowa, a beloved, and affluent family is suddenly murdered in the night, leaving the entire town going crazy, and locking their doors. The killer ends up being the last person who had reason to do it, and the excuses are as weak as they get. Fights over inheritances mix with fights over being kicked out of a mediocre apartment due to drug paraphernalia. This is the quintessential small town murder!! Along the way, we find out yard sales are considered a "festival" in some places, that you can only help your kids so much, and that no matter how bad your eye sight is, you know if a member of your immediate family is killing you!! This week, in Red Springs, North Carolina, a man with a long history of violent behavior goes way too far, and a young g woman ends up dead, sending the town into a panic, because this isn't the only recent murder of a young woman. The question is, how many more are there? Is he being railroaded, or have his actions railroaded others? This one has twists, all the way to the very end!! Along the way, we find out that swap meets are 90 percent confederate memorabilia, how the department of corrections isn't always so good at correcting, and that some people are just plain evil!! This week, in Amityville, New York, two people find love, and appear to be living the American dream, until some problems begin to arise. From these problems, someone unexpected is murdered, and the plot that is unraveled sounds too incredible to be true, as a tale of meetings, plans, offers, and cover ups were happening, in the background. This is seriously one of the crazy ones. All of it! Along the way, we find out that a fake haunting can make a town famous, that the term "dolphin head" may be a much more perverted thing than you'd think, and that you should always be sure to kill the person that you want dead!! This week, in Dewey, Oklahoma, a young man is born into the worst of circumstances, only to be raised in the best of circumstances. None of this matters as he follows a path of violence, prison, escape, and even more violence, finally finding out that he's not the first in his gene pool to end up in the same situation that he finds himself. His statements are brash, and his actions are much worse. This a truly crazy episode!! Happy 100th!! Along the way, we find out that rubber ducks are a magnet for baptist gamblers, that you can make murder worse just by what you say, and who wins the father/son death penalty race!! 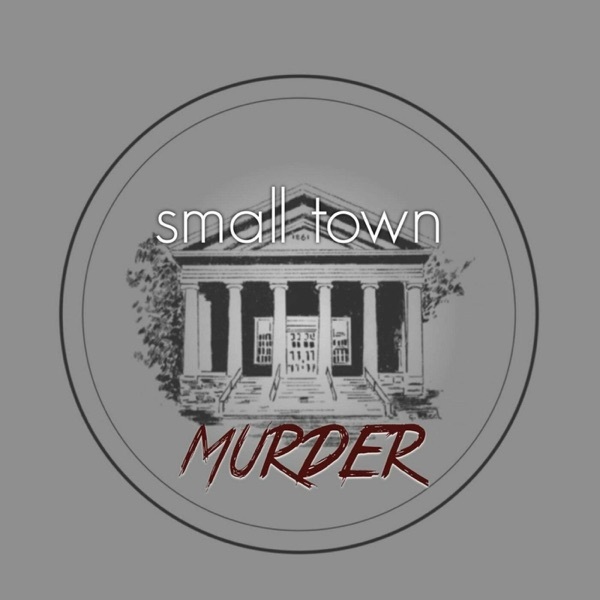 This week, we check out the town of Irvington, Alabama, where a man, with a troubled past, seems to be getting his life back on track, until one night goes terribly wrong, and things get out of control. This is a crazy story, with a bunch of unexpected turns!! Along the way, we find out how many albums one quartet can pump out, that you can actually get hot wings from a vending machine, and that you should never buy random pills from a stranger in an Alabama public restroom!! Hosted by James Pietragallo & Jimmie Whisman New episodes every Thursday!! Donate at: patreon.com/crimeinsports or go to paypal.com & use our email: crimeinsports@gmail.com Go to shutupandgivememurder.com for all things Small Town Murder & Crime In Sports! Follow us on... twitter.com/@murdersmall facebook.com/smalltownpod instagram.com/smalltownmurder Also, check out James & Jimmie's other show, Crime In Sports! On iTunes, PodcastOne, Stitcher, and wherever you listen to podcasts. This week, we look into the barren town of Canistota, South Dakota, where a young mother disappears from her home, leaving police to begin put the story together, using the recollections of a child. This case turns out to be not this killer's only handiwork. This story just keeps unfolding!! Along the way, we find out why the Amish flock to chiropractic care, that restraints in the back of a car are always scary, and how horrible people find each other & figure out how to do horrible things to others!! Hosted by James Pietragallo & Jimmie Whisman New episodes every Thursday!! Donate at: patreon.com/crimeinsports or go to paypal.com & use our email: crimeinsports@gmail.com Go to shutupandgivememurder.com for all things Small Town Murder & Crime In Sports! Follow us on... twitter.com/@murdersmall facebook.com/smalltownpod instagram.com/smalltownmurder Also, check out James & Jimmie's other show, Crime In Sports! On iTunes, PodcastOne, Stitcher, and wherever you listen to podcasts. This week, we check out the town of Kittery, Maine, where a man was on the run for the most unspeakable crimes imaginable, only to come across another potential victim. It's a brazen series of extra heinous attacks, leading to a legal battle that goes all the way to the Supreme Court! Hilarious!! Along the way, we find out just how many outlet malls one town can have, if finding out that you're adopted can lead to violence, and if lethal injection is too violent for triple murderer!! Hosted by James Pietragallo & Jimmie Whisman New episodes every Thursday!! Donate at: patreon.com/crimeinsports or go to paypal.com & use our email: crimeinsports@gmail.com Go to shutupandgivememurder.com for all things Small Town Murder & Crime In Sports!! Follow us on... twitter.com/@murdersmall facebook.com/smalltownpod instagram.com/smalltownmurder Also, check out James & Jimmie's other show, Crime In Sports! On iTunes, PodcastOne, Stitcher, and wherever you listen to podcasts. This week, we look at Canyon Lake, California, where a series of brutal murders leave police clueless, until one victim survives, and this ball of yarn begins to unravel. Everybody is shocked when they find out who is responsible for the deaths of 3 women, and the attempted strangling of another. The only things more shocking are the reason for the killings, and the fact that they might not have been the only ones... It's a crazy one! Along the way, we find out whether or not you can make a boat out of cardboard, if a boogie board could be a motive for murder, and if finding the bank cards of 3 dead women can be considered just good luck!! Hosted by James Pietragallo & Jimmie Whisman New episodes every Thursday!! Donate at: patreon.com/crimeinsports or go to paypal.com & use our email: crimeinsports@gmail.com Go to shutupandgivememurder.com for all things Small Town Murder & Crime In Sports!! Follow us on... twitter.com/@murdersmall facebook.com/smalltownpod instagram.com/smalltownmurder Also, check out James & Jimmie's other show, Crime In Sports! On iTunes, PodcastOne, Stitcher, and wherever you listen to podcasts. This week, we look at Waynesville, Ohio, where an escalating life of crime, prison, and more crime, finally explodes in one brutal confrontation that shocked the whole town. After a failed suicide attempt, the killer begs the state to finish the job! It's a wild, trashy edition of STM!! Along the way, we find out just how much sauerkraut can be eaten in one week, how violent people can still find partners to marry them, while still in prison, and if the state is cooperative if you beg them to kill you!! Hosted by James Pietragallo & Jimmie Whisman New episodes every Thursday!! Donate at: patreon.com/crimeinsports or go to paypal.com & use our email: crimeinsports@gmail.com Go to shutupandgivememurder.com for all things Small Town Murder & Crime In Sports!! Follow us on... twitter.com/@murdersmall facebook.com/smalltownpod instagram.com/smalltownmurder Also, check out James & Jimmie's other show, Crime In Sports! On iTunes, PodcastOne, Stitcher, and wherever you listen to podcasts. This week, we look at the town of Gun Barrel City, Texas, where a a serious of bad relationships, and failed marriages led to violence, and a series of disappearances, with only one suspect. Finally, a tip from an unlikely source leads to police to a couple of shocking discoveries!! Along the way, we find out just how easy it is to become a town, how hard it is to live with no windows, and that once a relationship escalates to gun fire, you probably shouldn't re-marry that person!! Hosted by James Pietragallo & Jimmie Whisman New episodes every Thursday!! Donate at: patreon.com/crimeinsports or go to paypal.com & use our email: crimeinsports@gmail.com Go to shutupandgivememurder.com for all things Small Town Murder & Crime In Sports!! Follow us on... twitter.com/@murdersmall facebook.com/smalltownpod instagram.com/smalltownmurder Also, check out James & Jimmie's other show, Crime In Sports! On iTunes, PodcastOne, Stitcher, and wherever you listen to podcasts. This week, we are LIVE at Zanies in Nashville, where we check out the town of Bellevue, Idaho, where regular family issues swelled out of control, in a short amount of time, resulting in shocking brutality, and an unlikely killer!! Along the way, we find out just how many sheep can possibly go through one town, why you can't trust anyone who offers you their bathing suit, and where not to throw out vital evidence of your participation in a double murder!! Hosted by James Pietragallo & Jimmie Whisman New episodes every Thursday!! Donate at: patreon.com/crimeinsports or go to paypal.com & use our email: crimeinsports@gmail.com Go to shutupandgivememurder.com for all things Small Town Murder & Crime In Sports!! Follow us on... twitter.com/@murdersmall facebook.com/smalltownpod instagram.com/smalltownmurder Also, check out James & Jimmie's other show, Crime In Sports! On iTunes, PodcastOne, Stitcher, and wherever you listen to podcasts. This week, in Mooresville, Missouri, where several people go missing, without anyone even noticing. Finally, a greedy crime leads to an investigation, and the discovery of five bodies, and a twisted back story, uncovering very unlikely killers. It's a crazy tale, in a tiny town!! Along the way, we find out how polite death threats used to be, how many drifters can go missing without anyone caring, and why a clay floor, under a lot of hay is the only place to store corpses!! Hosted by James Pietragallo & Jimmie Whisman New episodes every Thursday!! Donate at: patreon.com/crimeinsports or go to paypal.com & use our email: crimeinsports@gmail.com Get your tickets to see Small Town Murder LIVE at shutupandgivememurder.com/live or... Also, in April... Portland, Seattle, Chicago, Philadelphia, New York City, and just added... Nashville!! Follow us on... twitter.com/@murdersmall facebook.com/smalltownpod instagram.com/smalltownmurder Also, check out James & Jimmie's other show, Crime In Sports! On iTunes, PodcastOne, Stitcher, and wherever you listen to podcasts. This week, in Sunbury, Pennsylvania, the body of a man is found in an alley, and leads police to an unexpected killer, with a story to tell. This causes a massive search for bodies, and possible victims. Is it a different kind of serial killer, or just lies & manipulation?? Along the way, we find out what happens when things go wrong in a town, exactly what book is the worst book ever published, and when someone says they've killed 100 people, do you believe them? Hosted by James Pietragallo & Jimmie Whisman New episodes every Thursday!! Donate at: patreon.com/crimeinsports or go to paypal.com & use our email: crimeinsports@gmail.com Get your tickets to see Small Town Murder LIVE at shutupandgivememurder.com/live or... PHOENIX - MARCH 25 - http://phoenix.standuplive.com/event.cfm?id=501209&cart Also, in April... Los Angeles, San Diego, Sacramento, San Francisco, Portland, Seattle, Chicago, Philadelphia, New York City, and just added... Nashville!! Follow us on... twitter.com/@murdersmall facebook.com/smalltownpod Also, check out James & Jimmie's other show, Crime In Sports! On iTunes, PodcastOne, Stitcher, and wherever you listen to podcasts. This week, in Mineral Point, Wisconsin, a young man has a deep, dark secret in his past, that shocks everyone he knows, makes life very dangerous for several people that he feels have wronged him. It's a wild tale of lies, murder, and betrayal, with lives hanging in the balance. Oh, and it's hilarious!! Along the way, we find out why dead piglets make a lousy gift, how it was possible to inherit money from people you've killed, and what recourse you may have, if a known killer is stalking you! Hosted by James Pietragallo & Jimmie Whisman New episodes every Thursday!! Donate at: patreon.com/crimeinsports or go to paypal.com & use our email: crimeinsports@gmail.com Get your tickets to see Small Town Murder LIVE at shutupandgivememurder.com/live or... PHOENIX - MARCH 25 - http://phoenix.standuplive.com/event.cfm?id=501209&cart Also, in April... Los Angeles, San Diego, Sacramento, San Francisco, Portland, Seattle, Chicago, Philadelphia, New York City, and just added... Nashville!! Follow us on... twitter.com/@murdersmall facebook.com/smalltownpod Also, check out James & Jimmie's other show, Crime In Sports! On iTunes, PodcastOne, Stitcher, and wherever you listen to podcasts. This week, we look at Edgewood, Kentucky, where the seemingly perfect marriage of two respected members of the community turns out to be so far from perfect that a completely idiotic murder plot is hatched, and executed. It's a tale of greed, lust, denial, and pure stupid!! Along the way, we find out how dumb of a person you can be & still have a county named after you, how dumb of a person you can be & still have a job as a baggage handler, and how long you can get away with murder, even though all the evidence in the world is against you Hosted by James Pietragallo & Jimmie Whisman New episodes every Thursday!! Donate at: patreon.com/crimeinsports or go to paypal.com & use our email: crimeinsports@gmail.com Get your tickets to see Small Town Murder LIVE at shutupandgivememurder.com/live or... PHOENIX - MARCH 25 - http://phoenix.standuplive.com/event.cfm?id=501209&cart Also, in April... Los Angeles, San Diego, Sacramento, San Francisco, Portland, Seattle, Chicago, Philadelphia, New York City, and just added... Nashville!! Follow us on... twitter.com/@murdersmall facebook.com/smalltownpod Also, check out James & Jimmie's other show, Crime In Sports! On iTunes, PodcastOne, Stitcher, and wherever you listen to podcasts. This week, we check out Three Points, Arizona, where three people moved, to escape prison in another state, and ended up entangled in a disastrous mess of inept murder plots, and finally, very bloody results. It's a truly hilarious tale of despair, and cold blooded awfulness!! Along the way, we find out why this is a place where people run from their problems, how many people can live possibly in one tiny trailer, and how far into the desert you need to bury people if you don't want them found! Hosted by James Pietragallo & Jimmie Whisman New episodes every Thursday!! Donate at: patreon.com/crimeinsports or go to paypal.com & use our email: crimeinsports@gmail.com Get your tickets to see Small Town Murder LIVE at shutupandgivememurder.com/live or... PHOENIX - MARCH 25 - http://phoenix.standuplive.com/event.cfm?id=501209&cart Also, in April... Los Angeles, San Diego, Sacramento, San Francisco, Portland, Seattle, Chicago, Philadelphia, New York City, and just added... Nashville!! Follow us on... twitter.com/@murdersmall facebook.com/smalltownpod Also, check out James & Jimmie's other show, Crime In Sports! On iTunes, PodcastOne, Stitcher, and wherever you listen to podcasts. This week, we look at the suburban town of Elkridge, Maryland, where a brutal attack opens up investigations into years of unsolved murders, that reveal a common link, and DNA evidence that couldn't even be used yet. As time went on, so did science, and a history of truly awful acts came into focus. It's a wild case, with a big ending!! Along the way, we find out about the politics of a small town flea market, how simply leaving your DNA on a murder victim can somehow make you a suspect, and that there be nothing creepier than a mannequin!! Hosted by James Pietragallo & Jimmie Whisman New episodes every Thursday!! Donate at: patreon.com/crimeinsports or go to paypal.com & use our email: crimeinsports@gmail.com Get your tickets to see Small Town Murder LIVE at shutupandgivememurder.com/live or... PHOENIX - MARCH 25 - http://phoenix.standuplive.com/event.cfm?id=501209&cart Also, in April... Los Angeles, San Diego, Sacramento, San Francisco, Portland, Seattle, Chicago, Philadelphia, New York City, and just added... Nashville!! Follow us on... twitter.com/@murdersmall facebook.com/smalltownpod Also, check out James & Jimmie's other show, Crime In Sports! On iTunes, PodcastOne, Stitcher, and wherever you listen to podcasts.